didn’t manage to finish the #ocTEL course. Honestly, I don’t know how the people who participated found the time. It was a massive amount of watching/reading/synthesising/participating each week, and I just couldn’t keep up. I definitely want to go dip back in and finish working through the materials, but I definitely couldn’t manage it in real time. changed job direction (again). This is exciting, because elearning design! much more exciting, engaging, and up my alley than the more learning tech / support style role I’ve had, but ! so much more learning to do. It’s making me realise quite how little I know about the teaching and learning part of my job, so there’s definitely a lot of learning to get on with around that. you know, when my actual day job isn’t keeping me so busy that I can barely breathe. So. much. to do. zomg. Started the e-learning ecologies mooc on Coursera. Really enjoying the lectures so far, but I’m finding the forums a little overwhelming (in that way that mooc forums usually are), so I’m going to attempt to post my responses over here. Or at least also over here. I’ll see how I go.. When I started out on octel, I defined my big question as How to engage staff in TEL the perennial challenge for those of us who support the use of learning technologies in universities. Did I answer my big question? Yes and No. Lots of useful ideas emerged through the conversation on the group that we established for this purpose and which I have attempted to collate in this padlet but there is no simple answer to such a question and even if there was it would be different tomorrow. The job is never done in other words. Staff come and go and have different needs over time, as do students, while technology itself is always on the move not to mention institutional priorities. And don’t forget to keep asking the questions and looking for new answers. PS Check out the padlet for some useful resources. I had hoped for more collaboration on the padlet but have enjoyed working on it nonetheless. The Week 6 ocTEL webinar offers three views on enhancing and evaluating technology in learning. Those viewers with a particular interest could perhaps just watch a third of the webinar, that is, what most relates to them/their work. The first presenter, Mark Kerrigan (Anglia Ruskin University) focuses on an iPads in Science initiative, which is described in: Mobile learning: How mobile technologies can enhance the learning experience (pp.30-38). VEA: learner generated video vignettes to enable reflection and self-assessment via portfolio. McDowell, J. (2011). Using asynchronous video to promote learner engagement through the enhancement of assessment and feedback. Proceedings of the 6th International Blended learning conference, Hertfordshire. June 15-16, 2011. The third and final presenter (at about 30' mark), Keith Smyth (Edinburgh Napier University), focusses on the 3E Framework for technology-enhanced learning, teaching and assessment, now adopted and adapted by over 25 institutions. Smyth, K., Bruce, S., Fotheringham, J. and Mainka, C. (2011). Benchmark for the use of technology in modules; [based on the] 3E Framework designed and developed by Keith Smyth. Edinburgh Napier University, Edinburgh, Scotland. This document is a great resource, from the principle of not just using technology at the minimum 'Enhance' level, but, where desired and appropriate, to further develop learning at the 'Extend' and 'Empower' levels. See the image harnessed from this document below, which gives Smyth's definitions for the 3 E's. 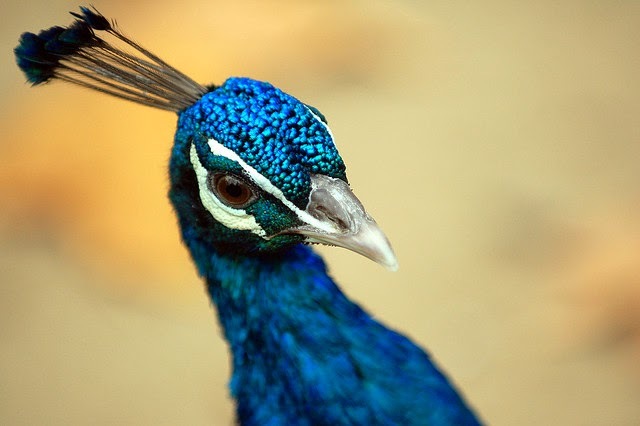 It is a couple of weeks since I viewed this webinar, and the ocTEL course is finished, therefore, I will leave this post as above, as an overview of the three examples of TEL embedded with useful, related inks, and let the webinar via YouTube speak to the evaluation side (which is attended to briefly given three presenters within one hour, but still useful). All three guest presenters offered valuable TEL examples, and I look forward to reading further on their respective works. Which took a while to attain due to completing all tasks on the site. 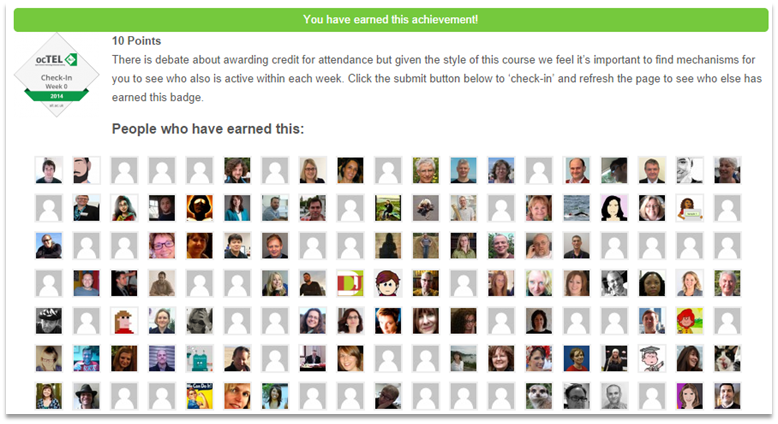 Not many of us have achieved this badge, out of 1100 participants; I think there are only around 4 or 5 of us thus far! Onward and upward now onto CMALT certification. My total point count for OCTEL 2014 was 13,265, it’s funny when I started OCTEL, badges and points did’nt mean anything, but they have helped drive me on through the course, only one last request can I transfer these into Argos points? Surely there must be a toaster in it? I suppose I should start with the why you would want to do this. Every time I join a Blackboard Collaborate session it’s like stepping back in time. Beside the appearance the technology in Collaborate is increasingly out of step with current trends. The software is built on Java, which is claimed to be in over 3 billion devices. Unfortunately for a number of users those 3 billion devices often doesn’t include the computer on their desk. Here is where the problems start as without enough permissions you won’t be able to install Java. To Blackboard’s credit they have spent time developing mobile apps not everyone is going to be able to use these either. Aware of these barriers for ocTEL we decided to investigate streaming Collaborate session to YouTube. The main advantage for use in getting this to work is that as well as being able to give an alternative means to watch the session we immediately have a recording to share for those who missed it. You can see the results in this session from week 3 of ocTEL. In this post I’ll outline the technique we use, which can also be more generally applied to any desktop application. It’s also worth highlighting that this is just one of many ways of streaming your desktop and you could achieve similar results using a Google Hangout On Air or the free ‘Wirecast for YouTube’ software Mac|Windows. The reason we didn’t go down that route was we wanted more control over the part of the screen being shared and we didn’t want to have to buy a Wirecast Pro license. This package, as it’s name indicates, is open source. Currently it’s Windows only and can be downloaded here (a multiplatform studio version is on the way). The main feature of OBS is to mix and stream different video/audio sources. The feature we found particularly useful was selecting a region of the desktop. Here are the steps we use to stream an ocTEL Collaborate you YouTube. To stream the event we need something to stream to. 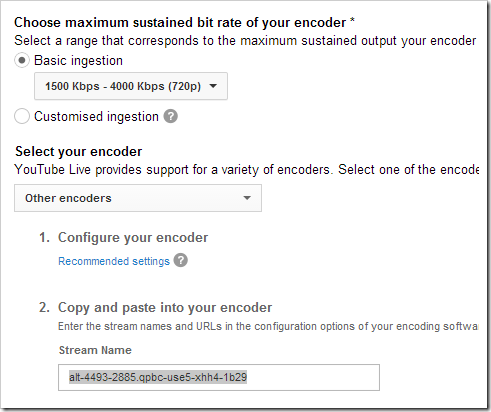 There is various guidance on the setup and requirements of a YouTube streamed event. The important step is to make sure you specify an ‘Other encoder’ to get a Stream Name/Key to enter in OBS later. Before you stream you need to join the Blackboard Collaborate session as usual. In ocTEL we need a generic name (A_L_T). As we are streaming the computers desktop and wanted to avoid any other notifications or sounds for ocTEL we did this on a dedicated laptop with the OBS software installed. For similar reasons we also turned off all Collaborate audible and visual notifications from the Tools > Preferences options. Once you are happy with your Collaborate layout/settings we turn our attention to Open Broadcaster Software (OBS). Further down this screen you might want to check the ‘save to disk’ option if you would like a backup of the recording … and your computer can cope. We now need to add some sources to our scene by doing a similar right-ckick action in the Sources list. For ocTEL we did a ‘Window Capture’ which lets you select the Collaborate window. At this point you could just click okay and import the entire Collaborate window but if you choose this option you might be better just using the free ‘Wirecast for YouTube’ mentioned in the intro. Instead for ocTEL we wanted just to show the presentation area and speak if they were using a webcam so checked the ‘Sub-Region’ box and click ‘Select Region’. Tip: When selecting the sub region you can only resize the area rather than using a combination of resize and pan. To do this move you cursor to the edge of the region until it changes to resize arrows. When you are finished press enter or esc, or click outside the region and click Ok in the main window dialog. Repeat the processes of adding a new source if you want to capture different part of the window. Once you have your sources right clicking on them in the source list gives you some basic layout and position control. If you would like to fine tune these click ‘Preview Stream’ which lets you click the ‘Edit Scene’ button. With this on when you click on each of you sources resizeable/positionable boxes appear around you sources in the preview window. Tip: You can turn sources on/off even during broadcast my clicking the checkbox next to them. You can also use the ‘Edit Scene’ button to enable/disable scene editing during broadcast. When you are ready to go live click the ‘Start Streaming’ button in OBS and visit you YouTube event ‘Live Control Room’ to check data is coming through and ‘Preview’ it. Finally when you are ready you can switch the from Preview to Live. Tip: Because we wanted to make sure the session was streaming during broadcast we left some dead air at the beginning and end. After the event has finished, but not immediately available, you can visit the video on it’s watch page and click the ‘Enhancements’ button to ‘Trim’ the clip. And that's it. This technique has it’s limitations in that, for ocTEL anyway, we did not broadcast or make the chat available, but it’s interesting to see the YouTube clips of the sessions are being watched and providing a jumping off point for our other channel content. If you can think of any improvements or other ways of doing this let us know. watch the recorded weekly Webinar (plus additionally to ocTEL guidance: post my blog reflections). I did not stray far from this self-imposed minimum, apart from participating in a small number of extra readings/viewings, and a few discussion entries/questions/responses on the forums. 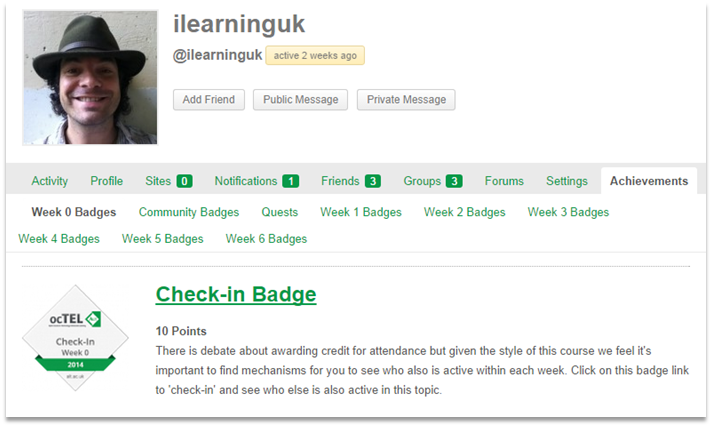 My two final ocTEL blog posts involve showing-off badges from the final weeks (this post), and my reflections on the week 6 Webinar (soon - still in pen-n-paper note format). Diana Laurillard’s 2013-01-31 ALT webinarhttp://repository.alt.ac.uk/2244/ (watch in particular from about 24 mins in to end). I was impressed by the video about the Saylor Foundation which I hadn’t come across before. I liked the apparent simplicity of the model and the motivations behind it – free, quality education for everyone, wherever they might be. I would love to be able to say that I worked in a context that could allow me to apply the principles of the Saylor method (free, open, accessible, vetted…) but it’s unfortunately not the case at the moment. It would take a cultural revolution in my institution to be able to envisage anything vaguely resembling the Saylor approach, but it remains a nice ideal objective to strive for. I think there are other contexts where such an approach could be applicable – I’m thinking here of professional associations involved in the promotion of certain disciplines. However, the major constraint and objection here could be that many people would worry that by creating such OER they would potentially be doing themselves out of a job. We need to be looking at new economic models at the same time we are looking at the new possibilities that the technology affords. I hope I can find a bit of time to get out and explore all the OE resources that are now out there. I also enjoyed this video, but I already knew a bit about Udacity. My ambition for a long time has been to make my subject matter compulsory across the university where I work as a basic requirement for any degree. For a long time we have been restricted by a lack of qualified people to teach courses. New technology could provide a solution to that and allow us to create a highly interactive, collaborative course with good evaluation and feedback methods. Using OER and different CC licenses could allow us to control production costs. Making the content available gloablly could contribute to enhancing the reputation and visibilty of the university.